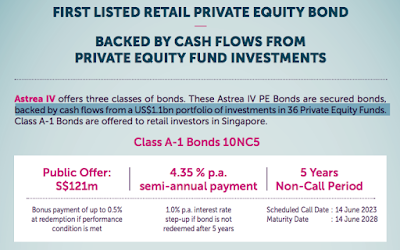 SG Budget Babe: IPO Analysis: Is Astrea IV Private Equity Class A-1 bond worth a BUY? Astrea IV Class A-1 bonds are the talk of the town right now, and I've received so many DMs about this so I'm finally sitting down to evaluate and write this. - You CANNOT use your CPF or SRS funds to apply for this bond. Now, don't get misled by the above headline published in The Business Times last week - this is NOT a Temasek bond. Rather, it is a bond issued by one of their subsidiaries. This is a really new and unique asset class because they're neither government-backed nor corporate bonds. Instead, they're private equity bonds. 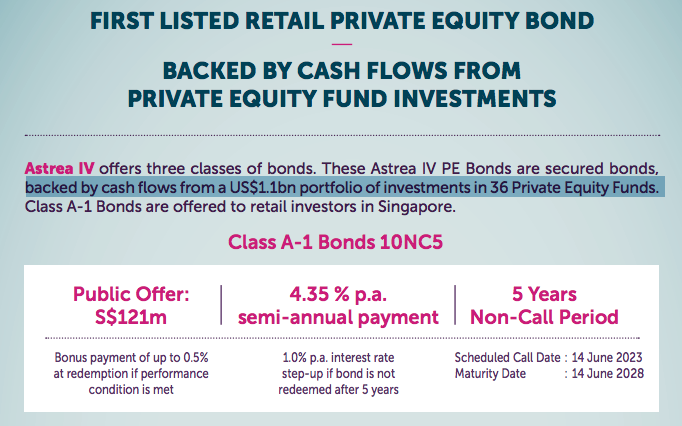 This is the 4th private equity bond that is being issued by Astrea, and the first one that is being opened up to retail investors. 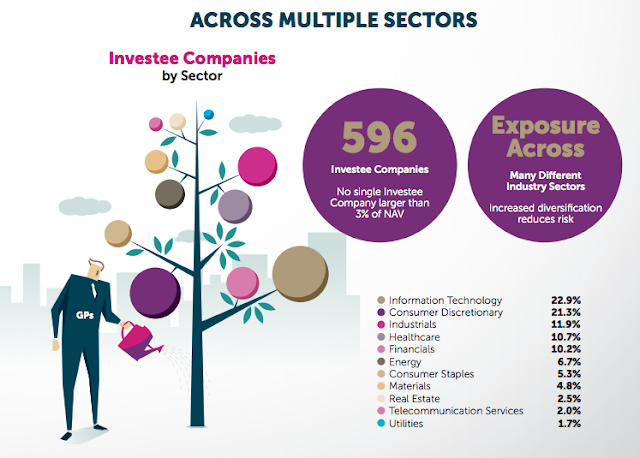 These Astrea IV Class A-1 bonds ("Astrea bonds") will then be used to invest across 36 private equity funds, which are invested into 596 underlying companies. Traditionally, I would dig up details about the investment assets, but since there's 36 funds and almost 600 companies, that's an almost impossible task because much information isn't available about these private companies, and neither does anyone have that much time anyway to scour through all. 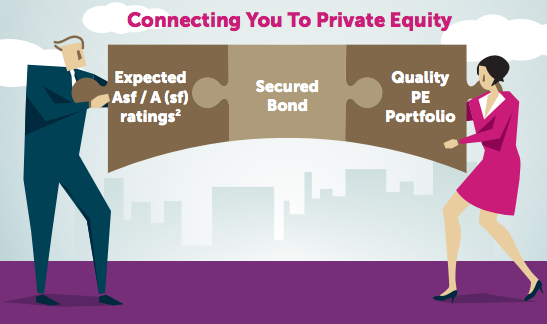 If you're unfamiliar with private equity, what they basically do is to invest in distressed or promising companies, go in with their expertise and restructure or turn the business around (usually making operational or financial improvements), with the final aim (usually) being to sell it off for a profit. As a result, the returns on such investments (when successful) can be tremendous - think 2 to 3 digit percentage figures at least. So in this case, when you buy these Astrea bonds, you're pooling your cash which will then be used to invest into these funds and underlying companies. The profits will then be used to pay the interest on your bond (4.35%) and finally return you your capital after 5 years. (There's a step-up interest portion in these Astrea IV bonds if they're not reclaimed after 5 years i.e. on 14 June 2023, but I'm not going to go into that because I've no intention to hold it for any longer than that, due largely to opportunity cost. There may be a bonus payment of up to 0.5% at redemption if performance condition is met. Okay, so now that you know this is NOT a Temasek bond...then who exactly is behind it? That's Azalea Investment Management, which was set up in 2016 and is a wholly-owned subsidiary of Azalea Asset Management, which is then owned by Temasek Holdings. Although they're relatively new as an entity, Azalea's management team apparently has extensive experience and institutional knowledge in the private equity space. The senior management team comprises of PE veterans and is led by Ms. Margaret Lui-Chan, who has been with Temasek since 1985. That was the first question that came to my mind when I read about the bonds being launched. Compare this to the Singapore Savings Bonds which is pretty much 100% risk-free (since it is backed by the Singapore government) and yields 2.63% for this month's issuance. 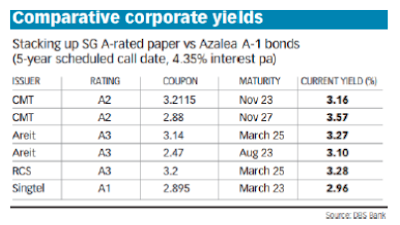 Now contrast this to a riskier corporate bond such as Aspial's bonds, which were launched for 5.25% previously. If this is from (albeit indirectly) Temasek, the next financial juggernaut in Singapore, then why is the yield so high?! Wouldn't it make more sense to price it at about 3+% yield, since the brand name Temasek alone would warrant some sort of a premium and perceived safety net? You didn't read that wrong :P for investors who truly understand the huge kind of returns that are seen in private equity (remember, 2 or even 3 percentage digits can be fairly common, if they spot the right gems / get lucky on the sale), why is the yield being offered to A1 bondholders here so low at just 4.35%? Since the risk undertaken by class A-2 and B bondholders are higher (they only get paid after A-1), they're compensated with a higher yield in order to incentivise them to buy these bonds. Unfortunately, you don't get to buy them as they're not open to the public and have already been fully subscribed anyway. You can sell the bonds anytime after 18 June 2018 on SGX, just like how you would with ordinary stocks. 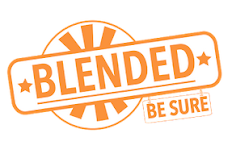 Otherwise, you can also choose to hold the bonds until its call date on 14 June 2023, or even longer if you want to be entitled to the step-up interest (provided the bonds aren't fully redeemed by then). Is there a chance that I'll lose my money? Will Temasek save us if anything happens to Astrea? As with all bonds, you should always evaluate the financial health of the investment manager before you decide whether to buy or stay out. Remember, that's the main reason why I said I was staying away from Aspial and Hyflux bonds back then? That doesn't really tell us much, especially when there's no year-on-year comparison to gauge how they've fared. Therefore, we can only look to their Loan-to-Value below, where you'll see that Class A-1 bonds have a LTV of 16.5%, which is relatively low, and thus the chances of default should also be quite low since only $181 million in the reserve account is needed to fully redeem Class A-1 bonds. Sounds good, but what's the catch?! I'm a huge skeptic, so this deal honestly sounded too good to be true to me. But after scouring through the prospectus and various bloggers / investment houses' take on this bond IPO, I struggle to find anything realllllly negative about it. Initially, I thought, is this some conspiracy?! Why would Temasek issue a bond with such a high yield?! Can't they get institutional or corporate loans for this? I bet companies would be scrambling just to subscribe! Or just get the private banks to issue it to their high-net-worth customers? Then I thought, or maybe they're in financial trouble, that's why they're raising this money from us mortals? But then I realised that the total sum of S$242 million raised really doesn't count for much, considering Astrea's access and connections to Temasek Holdings. - This is one of the safest bonds I've seen in a long time, especially given the A-rating by two reputable rating agencies (Fitch and S&P), not to mention Ho Ching putting her own personal name behind this (I assume, since she didn't correct the BT article nor ask them to apologise / correct / take it down). - Long track record since this is already the 4th Astrea bond being launched, with the first in 2006. - The Sponsor owns 55% equity interest, so they do have their skin in the game and are less likely to want to see this fail. - Their marketing is rock solid and has definitely generated the hype needed for this to become over-subscribed. Talk about FOMO! - It is not easy to understand, and is the first of its kind for retail investors. 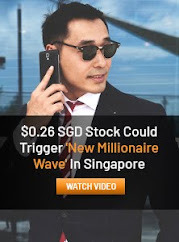 - It was slightly mis-marketed (in my opinion) since there was so much emphasis and hype on their connections to Temasek, leading many investors to think this is essentially a Temasek Holdings bond. Considering the hype and 4.35% yield, I'll be subscribing to these bonds and leave it as part of my bond portfolio (together with my CPF). After all, I'm the biggest skeptic of most corporate bonds, but this is one in recent years that actually managed to get my attention. 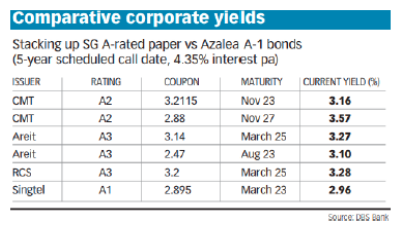 With their connection to Temasek, I doubt that Astrea will default on the bond interest payments, and I don't think their bond prices will fluctuate too much on the open market either. But please don't follow me - do your own homework! Here's the full 306-pages of the bond IPO prospectus as well as the Fitch report for you to read before you make your next move. Nonetheless, I'm betting this is going to be oversubscribed, and can only hope that I get some allocation from my application! Thanks for the write-up Dawn! Have been reading some conflicting literature on the topic, but what are your thoughts on the impact of rising interest rates on these bonds? Pretty informative analysis. For one thing didn't know that it is owned by a subsidiary. ikr...the way it was marketed was a tad misleading on the national papers, if I might say so myself. thanks for the detailed analysis! I tried finding out opinions from many "experts" on hwz forums and the consensus there is generally negative. Given my limited investing knowledge and the risk-vs-returns of this product, I might honestly give this a try. haha I realised lots of the negative comments came from anti-PAP / anti-govt folks as well, so it's always good to read their concerns while checking whether their opinions are valid, or if we're looking at the same thing and holding different opinions :) no right or wrong here! it is all about portfolio management - I have a portion of my portfolio allocation to risk-free or low-risk assets / dividend plays, undervalued counters, growth stocks, and then high-risk investments. given my age and longer investing timeframe, my low risk investments are almost nothing - save for my CPF. I've been waiting for the longest time to add a corporate bond into that segment of the portfolio, but as you've seen from my previous articles on corporate bonds that have been launched over the last few years...nothing really excites me or makes me confident enough to park my money with them. so since I need something to add to my low-risk segment, and Astrea looks to be the best option in 2 years that I've seen so far, I've put in a small allocation. off-tangent observation: a lot of people like to talk about their "expertly allocated" portfolios, but at the same time all are so secretive about it. 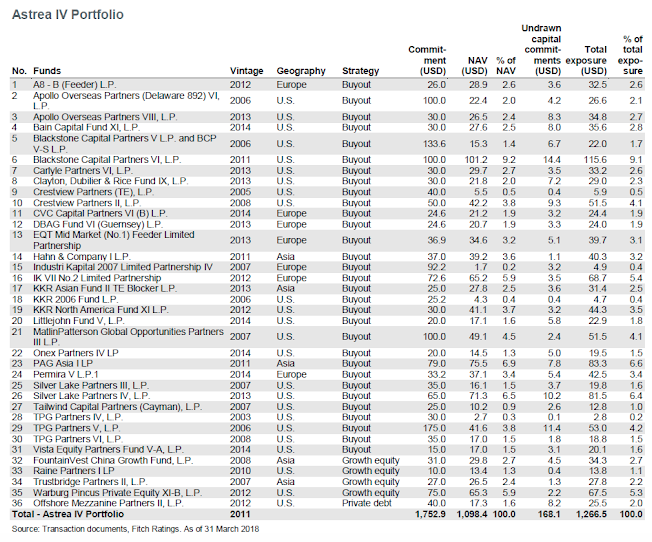 what do you stand to lose if, say, I were to copy your entire portfolio? 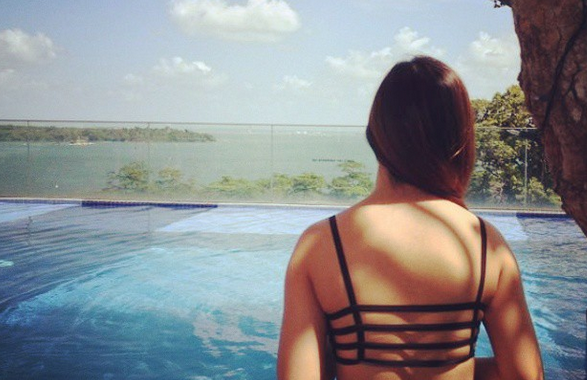 after all, the purpose of your blog is to help your readers towards financial freedom isn't it? apologies for the offensive tone; it's not meant to criticise or shoot you in anyway, but just something i'm curious about. clearly i don't understand much about the art of investing. Thanks for the detailed and clear write-up. As i am quite new in investing, just want to check on the interest rate pf 4.5%. 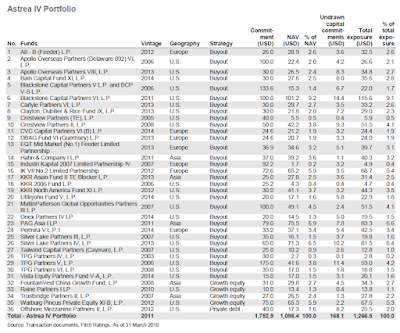 Is the interest returns based on annually or after the maturity period? Supposedly i invest $4k, i will get back $180 (interest) and $4k (capital) after 10 years? The 4.35% per annum is calculated every year you hold the bond, but broken into 2 payments to be paid out every 6 months. 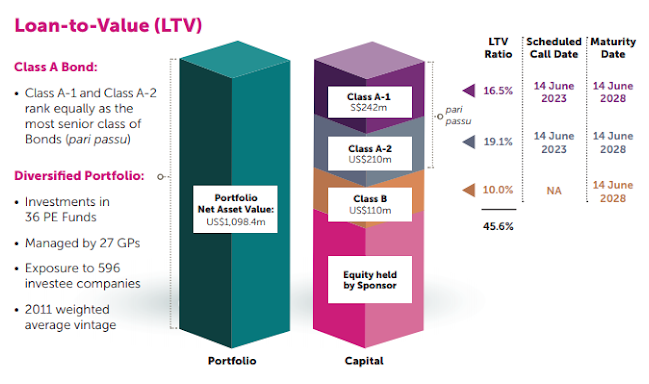 For a principal investment of S$10k, 4.35% pa means S$435. 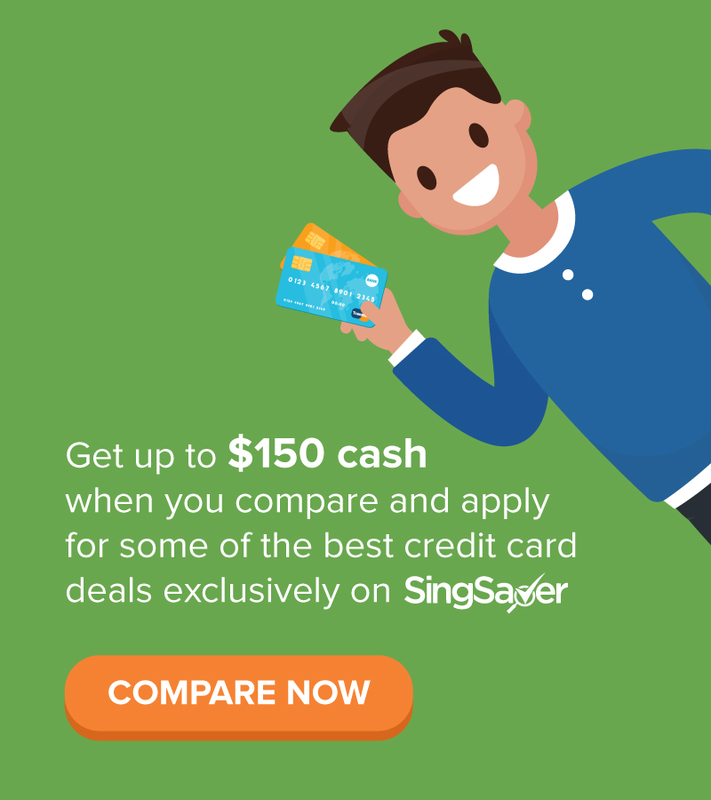 your bank account (which is linked to CDP) will see S$435/2 or S$217.50 credited every 6 months. how do we get notified on these IPOs?